Real Estate People – People news is always the most interesting news! Who is coming and Who is going. We will bring you this news from the market in general but more importantly we will share the news which we have been directly involved with before the industry publications have access to this news. Tara HRC is delighted to announce a new member to our team and a new area of specialisation. Marta Sybilska has joined Tara HRC and will lead our new Legal Recruitment team. Marta is a trained lawyer with a MA in Law from the University of Warsaw. She has spent the past 6 years working as a legal specialist at the Warsaw Chamber of Civil Law Notaries, which is the largest regional organization of the civil-law notaries in the Republic of Poland. The Chamber is a professional organization: a disciplinary and representative body, it is also a meeting place, a center for group decisions, an instrument for the study and consideration of the orientation of professional policy, a reception structure for the joint office services. This role has given her vast knowledge and contacts within the legal profession in Poland as she has helped develop and assist a network of over 500 notaries in the Warsaw District. While completing the attorney training she has also gained the professional experience as a litigator before Administrative, Civil and Criminal Courts, Her personal interest focused on cases involving criminal corporate liability and civil matters. With legal being an integral part of real estate, Tara HRC has always performed legal roles for our clients, but we have never considered ourselves experts in the sector, nor have we actively gone out to market with that claim. It is an area we have wished to develop for quite some time but finding the right real estate people with a bias in law to join our team has been a challenge, we are extremely happy that we have now found that person. Joanna Iwanowska has recently joined Tara HR Consulting as an Associate. In her new role she will focus on new business development and recruiting projects for real estate clients from both commercial and residential markets. Joanna brings over 13 years of experience from the real estate industry, both local and international. Her most recent role was with Eko-Park as Sales & Marketing Director and for UBM as Sales Director. Joanna’s previous job positions include also CEO and EVP of Central European Real Estate Associations Network (CEREAN) and Head of CEE Desk at REAS. Joanna is the author of numerous articles to the international business press, lecturer at postgraduate real estate program at Wyższa Szkoła Gospodarowania Nieruchomościami, and the speaker at international business meetings and conferences with other professional real estate people. She studied at the Foreign Trade Department of Warsaw School of Economics. Ewa Szafrańska-Mądry jako nowa dyrektor zarządzająca będzie odpowiadała za rozwój portfela nieruchomościowego spółki na terenie Europy Środkowo-Wschodniej, poprzez rozwijanie istniejących i nowych obszarów biznesu, włączając w to nabywanie nieruchomości, rozwijanie wachlarza usług świadczonych przez firmę w zakresie kompleksowego zarządzania aktywami, nieruchomościami oraz procesem deweloperskim przy realizacji nowych inwestycji. W zakres jej obowiązków wchodzić będzie także nadzór nad stroną administracyjno-organizacyjną firmy w regionie CEE. – Cieszę się, że dołączam do zespołu Balmain, który z powodzeniem realizuje kolejne projekty w Polsce, rozbudowuje swój portfel zarządzanych nieruchomości i wkrótce zamierza rozszerzyć zakres swojej działalności na inne kraje Europy Środkowo-Wschodniej. Tak bogate doświadczenie firmy pozwala na stworzenie profesjonalnej, dojrzałej oferty, w której stawia się na kompleksową obsługę w zakresie: zarządzania aktywami, nieruchomościami, prowadzenia projektów deweloperskich i wynajmu powierzchni komercyjnych – mówi Ewa Szafrańska-Mądry. Przez ostatnie 7 lat Ewa Szafrańska-Mądry zajmowała stanowisko dyrektora zarządzającego w grupie funduszy inwestycyjnych Grupa Azora. Wcześniej zajmowała stanowiska dyrektora ds. rozwoju w Apsys Polska i menedżera projektu w TK Development i Carrefour Polska. We are pleased to welcome one of our Polish colleagues to our Real Estate People section of the site. CBRE has grown its industrial and logistics team, with a little help sourcing real estate people from Tara HRC of course! William Shim has been appointed a senior consultant for APAC/Central and Eastern Europe at CBRE. He will be responsible for building and strengthening relations with Korean occupiers across the region. Lately, he has served as a sales manager at a Korean supplier of LG Electronics, FineAltech. In the past, Shim has also worked in marketing at the NBA and the New York Knicks. In 2012, he obtained MBA from Warsaw University of Technology Business School. Shim will be reporting to Joerg Kreindl, who heads CBRE’s Industrial in the CEE region. Maciej Zawada has joined the industrial and logistics team as junior property negotiator. He will be responsible for market monitoring as well as the leasing of warehouse and industrial space in the Upper Silesia, Małopolska and Podkarpacie regions of Poland. Maciej graduated from the international relations faculty of the University of Warsaw. Currently he studies at the Warsaw School of Economics. He speaks fluent English. His hobbies include trekking, football and travels. Maciej has been involved in many charitable projects – he has worked as a volunteer for the WWF and Polish Humanitarian Action, among others. Tara HRC has once again bolstered its ranks and delighed to annouce the joining of Michal Konopa. Michal will join as an Associate and concentrate on the commercial real estate sector. Michal always thinks of better ways of doing things. That is why he always been interested how things are done in other countries. Being at the university he decided to move to Dublin for a year, then he became a sales representative in Sydney. Alongside with his travels he graduated from sociology (UJ) and political science (UP) in Krakow. A bit later he supplemented his education with postgraduation studies in real estate and obtained a real estate licence. Located in Krakow Michal started working for English real estate companies: at Investpolska he serviced English clients investing in Polish properties, at The Step he developed a concept of a “property supermarket”. He set up his own butique brokarage company JKMK NIERUCHOMOSCI specializing in top end residential rentals and sales in Krakow. In 2013 he sold his firm and relocated to Warsaw, where he worked for a commercial real estate agency Rudnicka and Consulting. Michal loves outdoors. You can often see him camping by a lake with his wife and 2 sons. Ecologically conscious often chooses to use a bike in the city. With his entrepreneurial spirit, dynamic personality, positive attitude and good sense of humor it feels good to have Michal in the office. 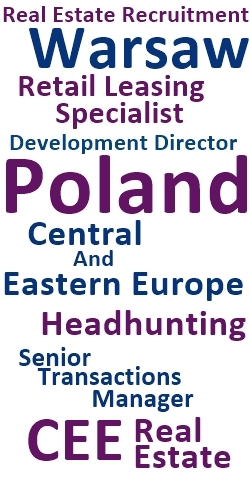 We are happily setting him off on his headhunting journey working with numerous real estate people in the Polish and CEE markets! Traditionally Tara HRC has focused mostly on roles within commercial real estate but over the last 12 month we have received more and more requests from the areas of construction, engineering, facility management and building materials. We took the decision some months ago that given the level of activity we are seeing in these areas we should give them the attention they deserve. The problem we had was in not having an experienced person who could dedicate themselves to these sectors. We have now found such person. As of today, we are very proud to announce that we have found such person. Her name is Maria Szykuła. Maria studied in International Relations in Lodz. Following her studies she moved to Warsaw and found a role in a local recruitment firm called Look for Staff. Here she focused largely on technical roles. Maria stayed with Look for Staff for two and a half years before deciding that she would like to work with more international companies. She then joined Property Talents, their cooperation lasted only 3 months and was ended very amicably on both sides. We were very quick to recognise Maria`s potential and wasted no time in getting her on board. Her experience in recruiting real estate people for technical roles over the last 3 years is exactly what we need right now. More importantly she is bursting with enthusiasm and has a real desire to develop as a headhunter in the technical sector. We believe at Tara HRC we can give her the platform and environment to meet her development aspirations. Łukasz Wojnarowski has recently joined Tara HR Consulting as an Associate. In his new role will focus on new business development, especially in the sector of real estate developers and engineering consulting. Łukasz began working in the real estate industry in 2008, joining ORCO Property Group. Then, he gained experience at the National Sports Centre working on the National Stadium project. In his last role in Ghelamco, Łukasz completed 9 A class office fit out projects delivering 11.000 sqm. Łukasz completed Master degree in Construction Management at Warsaw University of Technology and graduated from Warsaw University of Technology Business School with the diploma of International MBA. Łukasz Wojnarowski dołączył do zespołu Tara HR Consulting na stanowisku Associate. W nowej roli skupi się na pozyskiwaniu klientów, przede wszystkim z sektora firm deweloperskich oraz inżynieryjno-konsultingowych. Łukasz rozpoczął pracę w branży nieruchomości w 2008 roku dołączając do zespołu ORCO Property Group. Następnie zdobywał doświadczenie w Narodowym Centrum Sportu przy realizacji Stadionu Narodowego. W swojej ostatniej roli w Ghelamco zrealizował 9 projektów fit out o łącznej powierzchnii 11.000 m2. Łukasz ukończył studia techniczne na Politechnice Warszawskiej oraz uzyskał tytuł International MBA w Szkole Biznesu Politechniki Warszawskiej. Turner & Townsend has appointed Iain Leyden as Country Manager for Poland. Iain will be leading our activities from offices in both Warsaw and Krakow. Iain brings with him 20 years of experience as a project management professional, having worked in the commercial property markets in the UK, Poland, Romania and other Central and Eastern European countries. Iain is a specialist in mixed use, commercial office, retail and industrial sectors of the construction industry. Trained and qualified as a quantity surveyor in Glasgow, Iain began his career in project management working on the largest mixed use development of its kind in Scotland, the Braehead Shopping and Leisure Centre. Following this Iain was employed as a researcher for the expert witness on what was then the most high profile dispute in the UK construction industry, before moving to a senior project management position on the Złote Tarasy Project in 2002. Iain is a Fellow of the Royal Institution of Chartered Surveyors (RICS) and currently serves on the RICS board in Poland where he is responsible for the Built Environment Group. Before joining Turner & Townsend, Iain operated and was the proprietor of independent project management consultancy Caledonian Project Management Sp. z o.o. and served as a director at both King Sturge building consultancy department and Colliers International. Commenting on the appointment, Iain said: “The opportunity to steer Turner & Townsend’s activities in a country which is leading Europe in challenging times is very exciting for me. Michal Soták one of the leading real estate people in the research area has been appointed as the new head of research at Cushman & Wakefield for the Czech Republic and Slovakia. Prior to joining Cushman & Wakefield, Soták worked at Develon (2007-2011) as a development manager. He was involved in acquisitions, obtaining financing from banks, and developing and managing real estate in the company’s portfolio. Jones Lang LaSalle has appointed Robert Mayhew as director of CEE banking valuation. Mayhew began his career in London more than 20 years ago, joining the valuation department of Edward Erdman, which later became Colliers International. In 2001, he joined DTZ in Poland as head of valuation and subsequently worked as a regional director of valuations for the company in CEE, based in Hungary. In 2005, he returned to Colliers International to help establish the company’s pan-European valuation team and spent the next two years valuing assets across continental Europe. Mayhew joined Jones Lang LaSalle’s real estate people in 2007 as head of valuation and strategic consulting within its Russia & CIS business. In early 2011, Mayhew moved to London with Jones Lang LaSalle where he provided valuation advice in both the UK and Europe, in particular in relation to non-performing loan portfolios. He was elected a Global Vice-President of RICS in March 2012. He was a member of RICS Russia & CIS between 2007 and 2010 and is currently on the RICS Europe Board, responsible for valuation matters.